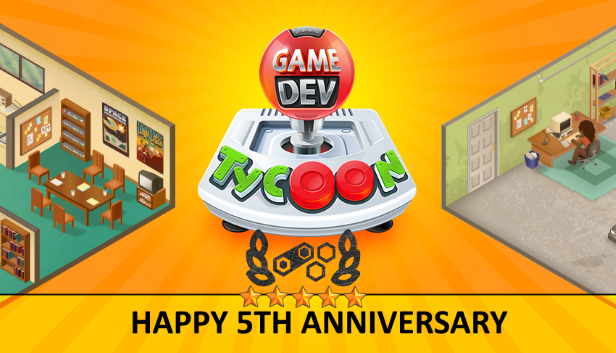 It’s been five whole years since Game Dev Tycoon released on Steam. Time for a brief illustrated trip through the game’s history. Back in 2011, my brother Daniel and I (we are both software developers) decided that we wanted to try to make a game. After days of brainstorming and discussions, we settled on the idea of making a game dev simulator. We were inspired by Game Dev Story on the iPhone (made by Kairosoft) and wanted to make a game in that genre with our own spin on it. 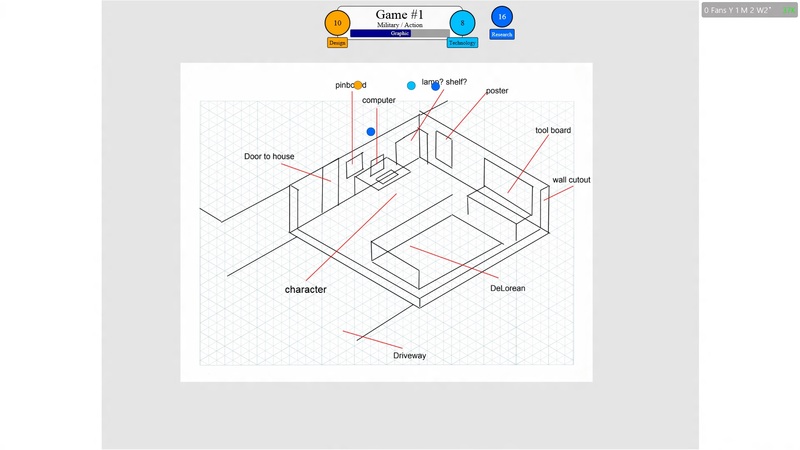 Our intention was to make a game dev simulator where the player would have finer control over the decisions of what to focus on during game development. Game Dev Tycoon started, as many games do, on a single piece of paper. Back then, we imagined the game as a turn-based game with almost no graphics for phones. 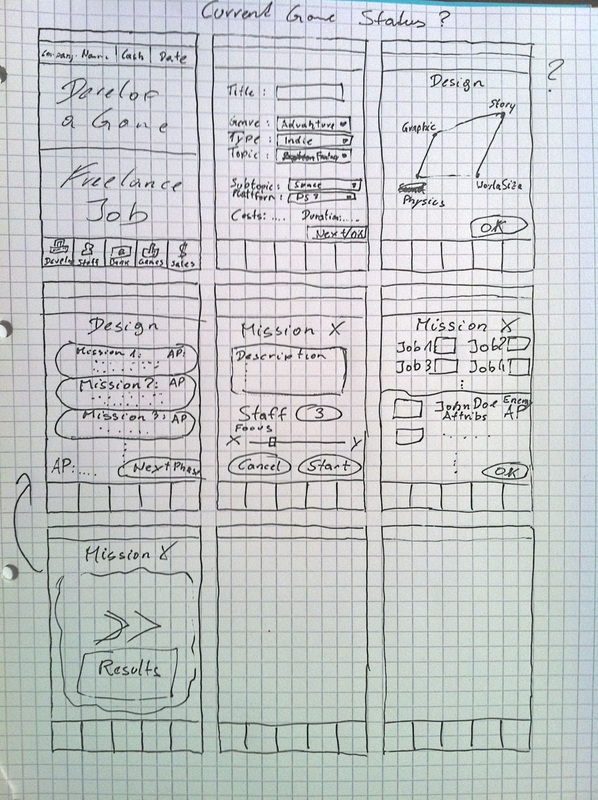 Our plan was to create a small but fun game to gain experience and test the market. This is what the game looked like as a prototype. We spend a few months in this prototype developing the algorithms on how points are generated, what decisions players make, and how virtual games are reviewed and judged. Next, we realized how difficult it would be to be successful on mobile without a big marketing partner so, when Windows 8 (remember Windows 8?) was announced, we pivoted hard towards Windows. 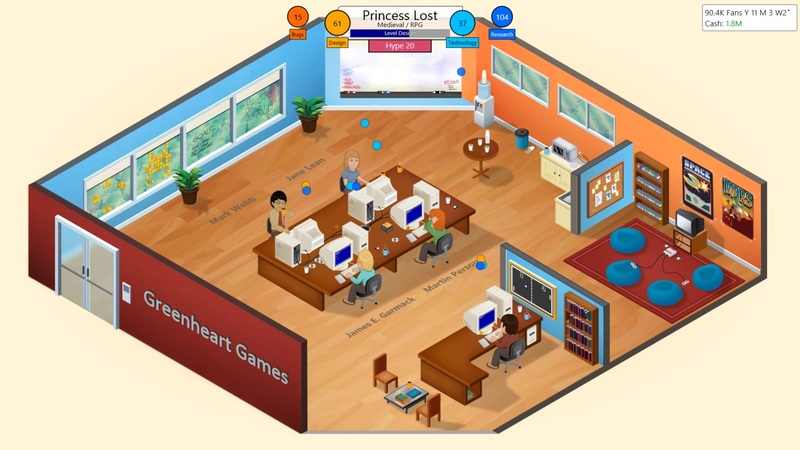 Our plan was to make Game Dev Tycoon the first simulation game on the very first Windows Store which we thought was a decent marketing strategy. Windows 8 was all about tablets and touch-screens so our designs – intended for phones – no longer cut it. 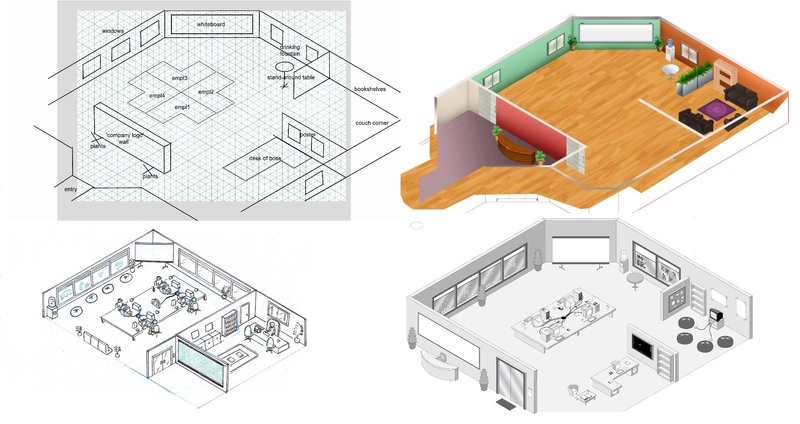 We changed from a turn-based simulation game with almost no graphics to a real-time isometric simulation game where you see your office at all times. Windows 8 only had two reasonable technology choices: C++ with Microsoft’s Windows-specific XAML frontend or HTML5. We both had XAML experience and Daniel is a great C++ developer (me, less so :D) but we also both disliked XAML. More importantly, while we heavily bet the game on Windows 8, we had enough experience in the Microsoft ecosystem not to trust the hype blindly. 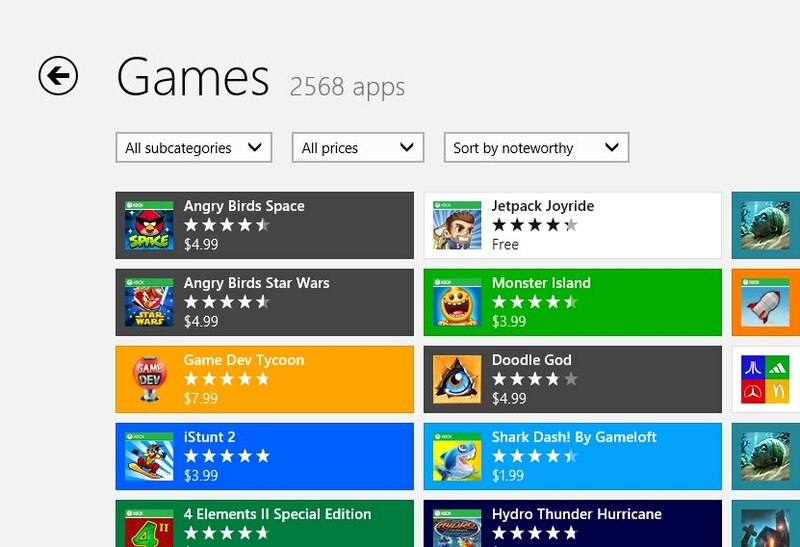 If the Windows 8 Store would flop, what would we do? With that in mind we opted to go for a versatile cross-platform technology instead of what we knew and decided to write our game in HTML5. Neither Daniel nor I had ever written anything in HTML5 before. 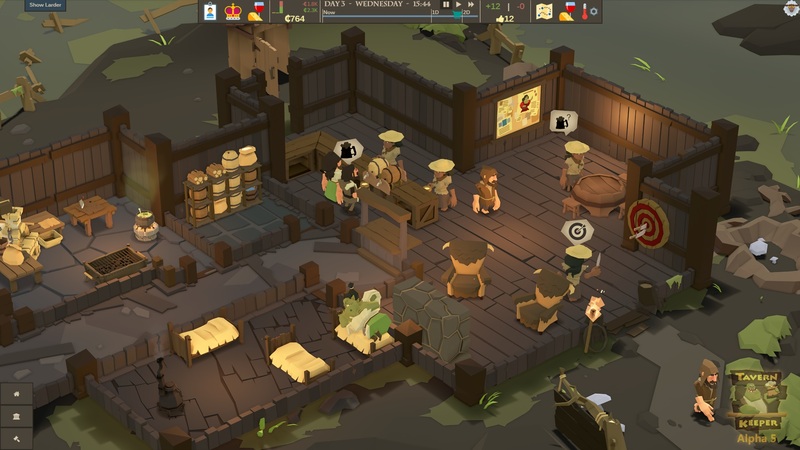 Initially, both Daniel and I worked on the game as a side project to our full time jobs but we soon realized that we needed to give it much more attention. I transitioned out of my job and put my savings from 10+ years as a software engineer behind the project to hire artists and finish the game on time, while Daniel worked hard next to his job and on weekends. If my money would run out, he’d have to support us both. It was an intensely stressful and uncertain time full of the highs and lows of indie development. 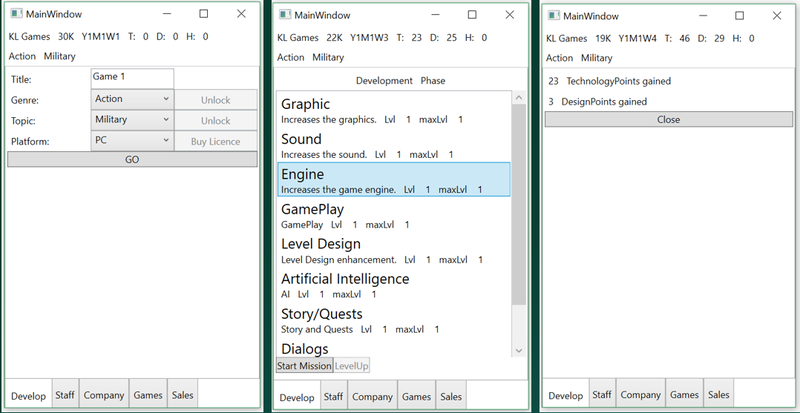 Three months later, we published a free ‘lite’ version which just contained the first level of the game on the Windows 8 Consumer Preview store. The rest of the game wasn’t even close to being finished yet. This looks very familiar at a glance but in the final version we replaced the 3D modeled characters by more cartoony 2D ones and reworked the level art to be more crisp, stylized, and colorful. We also ditched the cut-off wall look. Left: preview style. Right: release graphics. We were quite nervous releasing just a preview game but within days we had nearly a thousand downloads and 4.5 star reviews. We were the very first simulation game on the Store. Fueled by the positive response and early reviews, we put our heads down and developed the rest of the game. Here are a few images from the process. This is the evolution of our second level. From basic sketch and a painted version in our old art-style to complete reboot and finally a vector draft which is quite close to what we ended up with. 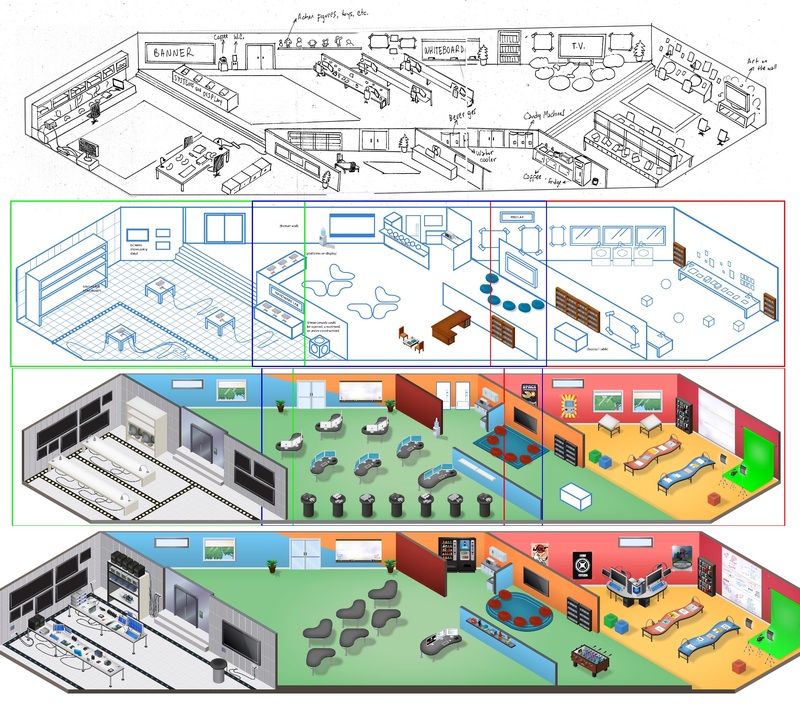 By the time we designed the last level we had optimized our design process. Below you see a much more streamlined progression from sketch to layout concept to final piece. On the UI front, we quickly decided against a more commonly seen fancy UI and instead focused on big readable text and minimalism. Here is a comparison between an early design versus what it ended up looking like. 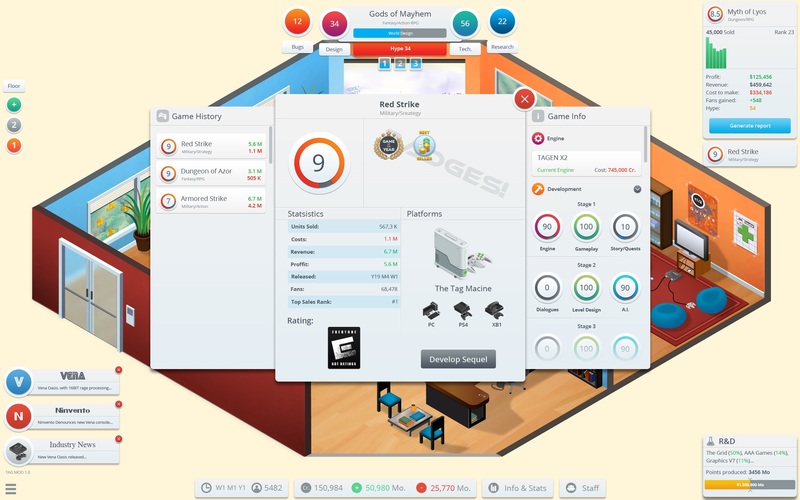 After 8 intense months of work, Game Dev Tycoon launched on the Windows 8 Store on December 11th, 2012. With around 420 sales on day 1, we made it to spot 3! Sadly, Windows 8 and particularly the Windows Store didn’t quite reach the adoption we had hoped for and sales quickly dropped and leveled out. We knew that we had to port the game to a wider audience if we wanted to be able to work on another game full-time. Our previous decision not to use Windows-Store-only technology for the game now proved crucial and within a few months we made the game run on desktops for Windows/Mac and Linux. Late April 2013, we published the game on our own store via our website. At the same time we released a modified version on torrent site as a little piracy experiment. I still remember saying that after working non-stop on the game for over a year, I was planning to take a week off. I was just gonna publish the results of our piracy experiments first. I published the story late at night, went to bed and when I woke up the next morning everything was on fire. Our piracy story went viral overnight. We had 500 emails in our inbox. Our website was down because it couldn’t handle the traffic and Game Dev Tycoon was suddenly discussed everywhere. We were utterly unprepared for the sudden spotlight. Emails kept flooding in and because of the sudden influx of players so too did the bug reports. At the same time the discussion around our experiment exploded and the press wanted to talk to us. We hired some help to handle emails but decided to listen to our players and retreated from the spotlight to focus on the game instead. With all the new players, lots of valuable feedback and critique was brought to our attention and after we were Greenlit for a Steam release we decided to address those concerns. 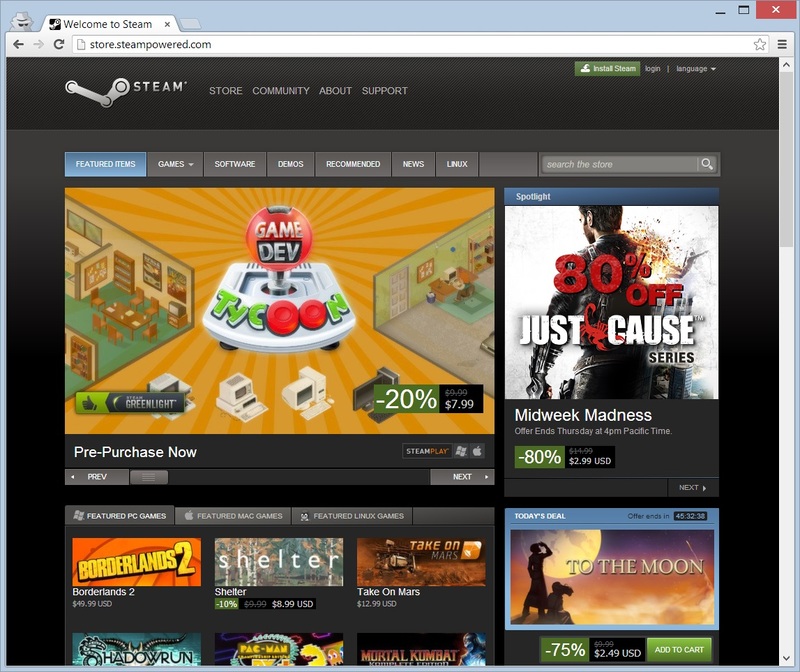 Four months later, this resulted in the release of the improved Steam version on August 30th, 2013. Since the original Steam release a lot has happened. – We have released 58 updates to the game. – Most recently, a major content and quality-of-life update introducing new topics, everyone’s favorite new console, a brand new game mode and several important UX improvements went live for free. – The technology we developed (and open sourced) to enable Steam support for our game has now been used in 23 other Steam games. – Game Dev Tycoon has been ported to iOS and Google Play. – We have manually replied to nearly 40K emails in five years. – Our modding community is still going strong with hundreds of mods and dozens which go far beyond simple content additions. From the ever-green most subscribed mods to more recent additions like the Compact Topic & Genres mod and the much anticipated upcoming TAG MOD. Screenshot from the upcoming TAG MOD by Bellwood Studios. We are incredibly honored and humbled by the success of Game Dev Tycoon and for the past five years we have turned this small two-brother team into a seven-people indie studio and poured our heart into developing our next game: Tavern Keeper. It’s not ready yet but we plan to write an update in coming weeks and give you a better idea of what to expect. Quite an old screenshot by now. We’ll aim to share more soon. Please consider following our developer page and sign up to our newsletter if you want to know more. We are also thinking of doing a special Game Dev Tycoon developer stream in a week or so. If you’d be interested in that, please let us know in the comments.